Sol Luna Park is Initiative's largest apartment complex that offers seven different floor plans and easy access to MARTA bus and rail. Call 404-288-5633 for leasing information. 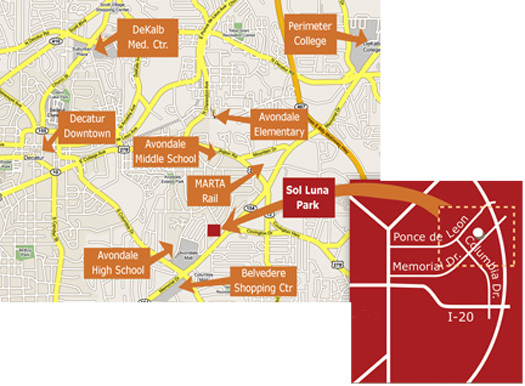 Sol Luna Park is located in Decatur at 3850 Memorial Drive, Decatur, GA 30032, just one mile from Kensington MARTA station in Avondale Estates and one-half mile from the new Wal-Mart Supercenter on Memorial Drive.